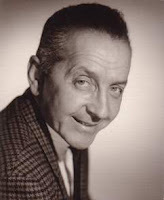 What makes me enjoy the dancing of this Dean Collins guy who danced in so many movies during the 1940's? I've been asked this countless times, while out and about, and I have never actually written about my personal opinion. I've inherited many of his belongings and collected tons of memorabilia which allowed me to create an archive in his name but that all has nothing to do with my personal fascination. I could use perhaps simply use two words, "It's real" , but that would be to easy and would not really answer anything for people wanting to know the details or my in depth thoughts. So I'll start with simply the way he dances on film, to me watching Dean is simply like watching someone that is very confident. It's as though he has nothing to prove, because he knows what he is doing and doesn't care either way what the viewer thinks. All of his dancing is so genius, his subtle movements, foot work and the way he moves his girl, is all part of his master plan or agenda in dance. He take you with him, you watch him, you watch his feet, then his partner, back to him...it's a visual roller coaster in time with the music. Sometimes, his magic is created with some type of tension against the music or movement with his partner which then becomes to synced It can only be described by me as a swell in the water pushing a floating object along so effortlessly. Other times, it's as simple as him knowing what to do in order for the viewer to watch certain parts of his dancing. He has control, he can manipulate the viewer no different then a magician. He is a performer who uses as little as possible most of time and then can or will explode into a specific trick or movement that's necessary to dazzle the non-dancer, for Dean is no doubt "The dancers dancer". Although Dean Collins will go down in history as the guy who brought the Lindy Hop from New York in Los Angeles, he claimed what he did was "The Lindy" once he had developed his own style which became the standard type of dancing by those in Los Angeles. Dean's "Lindy" could be described at a watered down version of what was being done by the dancers in Harlem's famous Savoy Ballroom, however that description would mean you could simply add water to something that is already there which is simply not true. Dean "Lindy" is something he created using the foundation of what was already there. His strict discipline of body movement, his being able to separate the lower half of his body with the upper is an isolation rarely scene by any dancer of any form. 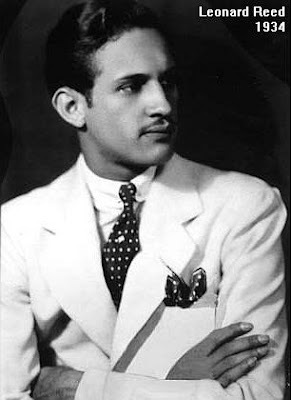 His foundation of his dancing was created by syncopated steps in succession as opposed to the former style of sparring using these steps strictly as decoration, or the generation that would come after of over killing these syncopations as we see in European Boogie Woogie dancing. Dean's formula was just right. Another thing about Dean's dancing was knowing when and how to show off his partners. He knew not only when but how to show of his partners, in way that had not been done before. Certainly, this was in part to the era in which he developed his type of dancing, but none the less he was the first to be documented in film showing off the follow, as a lady as opposed to showing her off as an athletic counter part. This aspect surely gained hi popularity among the ladies of that time, allowing them to feel like a glamorous movie star such as Lana Turner or Betty Grable, instead of the next gold medalist in the high jump. Dean's most popular partner Jewel McGowan was allowed to shine in ways that no Lady has ever been able to do, and Dean's style with Jewel will never seriously be replicated with out Jewel. When the two dance it was magic undaunted and unequalled since, However, when Dean Performed or in many times competed he teamed up with Irene Thomas. 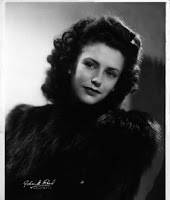 Irene was a master Hoofer and performer, who graduated in 1939 from Hollywood High school and too her going out and Jitterbugging was something all the kids just did. To her it was easy child play and she loved to push the limits of footwork variations as well as hamming it up for the audience or camera. When Dean and Irene danced it took on a whole different picture, one of intense footwork variations one could almost see as a battle, or perhaps two musicians using a vocabulary so advanced that only the baptized could understand it's true greatness. Regardless of what is going on through their feet, and movements and patterns the atmosphere around the dance was always one with ease, confidence and an attitude of genius that was never over done with cockiness. If anything, I would say most of his dancing tilted towards modest, which perhaps was an alter ego off the floor, none the less for many dancers that is the very escape, or explanation of dance. As dancer, watching him we can sometimes cut through the persona we see on film as we witness in "Junior Prom" as he parades through one girl as a time with ease showing each one off until he finally ends with the actress for whom he taught a simple routine too. Some clips of him are downright silly, in which he dances with complete non dancers creating a catastrophe, but what the heck it was simply a paid gig, which meant paying rent and eating food, because few People realize today that during these war years him and his friends shared one suit, which they would trade off using when going to casting calls. Even on uptempo songs such as "Hi Neighbor" in 1941, he retains the attitude, confidence and sophistication in his style that until then would have not been seen by any dancer. 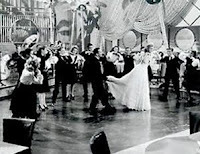 But then we witness his humble dancing in "Hellzapoppin" also in 1941 as he dances with film star Martha Raye while later in the film we witness the worlds best Lindy Hoppers dazzle in what is considered the best filmed Lindy Hop number in history. Dean Collins was a one man act who knew what he needed to be his best, he was a master jitterbug who used his abilities like a credit card, and used it to the fullest it was worth. Frequenting the right dance spots around Hollywood he would not only constantly check his talent against other local dancers but also make the right appearances in the upscaled bars and clubs to rub elbows and make contacts with the movie stars of the silver screen. 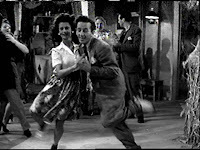 While he was simply a Jitterbug dance bum, As Jewel referred to him as, he was able to show of his genius enough to give monthly private lessons to Arthur Murray, go on dates with stars such as Lana Turner, become good friends and hang out with Musicians like Harry James and find time to teach Shirley Temple how to dance. His clothes unless costumed by the film department were at best simply nice casual, certainly nothing special of that time. Today's vintage aficionados' do their best to recreate that look, but certainly it was a look for the entire population of Jitterbugs and not just Dean's. In 1984 The Los Angeles Times, had a nice obituary for Dean when he passed away calling him "The King of Swing". I wouldn't disagree that he was a King, but there is a lot of Kings, I think a more suitable title would have been "The Genius of Swing", for too me there has simply never been anything like him, and that's my fascination. I love that picture of Jewel! Very beautiful. How about a bio on Jewel McGowan. There seems to be almost nothing known about her and what happened to her after Dean. Damn, Peter! Nicely put. Certainly reading about your fascination and respect towards him made me respect him even more as well. Have to check out more clips about him. Thanks for the inspiration! ;). this was well-worth reading and will be well-worth re-reading, and re-reading... and re-reading. I agree with the poster above that said a profile or bio about Jewel McGowan, I have tried hunting information on google but nearly all of it is repeat of the same already known knowledge. Also I enjoy reading your articles, please keep updating! I agree with the above about Jewel McGowan for sure. I suppose if i was the follower the article could of easily been "The thing about Jewel". 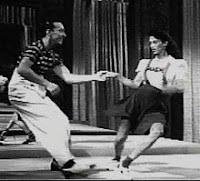 Lindy Hop historian Terry Monaghan wrote that Jewel was retained by the Jack Cole dance troupe, "for her Lindy Hopping expertise." He was my uncle. He was a genius. And very fun too.